I tried a new recipe last week, Chicken Scarpariello and I used Rachel Ray’s recipe off of the Foodnetwork. 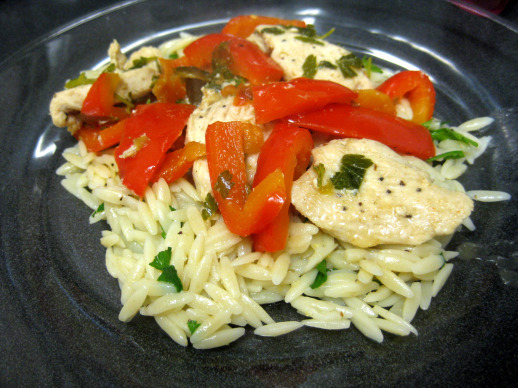 I still consider myself a cooking novice and this recipe was fun for me because I’ve never cooked with Orzo before and haven’t even heard of cherry peppers. 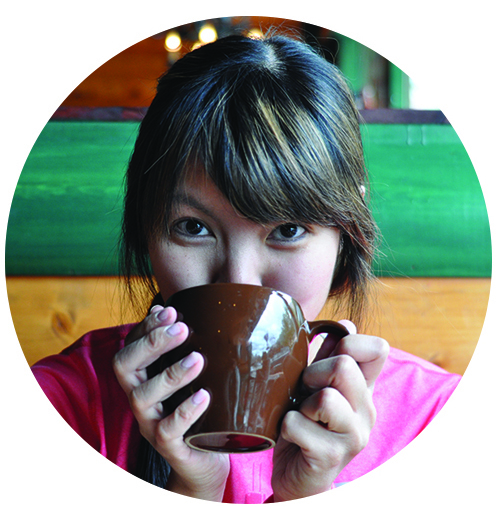 I enjoy learning new things! 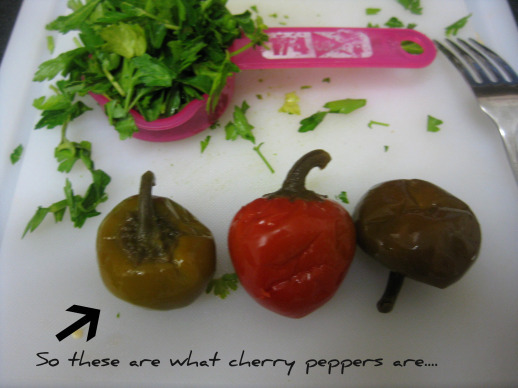 So the recipe called for 3 cherry peppers, drained. I used “drained” as my clue and just looked at where jarred jalapenos are at the groceries which are in the same aisle as jared olives. Sure enough, that’s where Cherry Peppers were. They’re kind of cute. See below. Overall, it’s a pretty easy recipe with a lot of heat. I followed it to a T. Here’s the Chicken Scarpariello about done. I especially love the lemony orzo. These recipes are being filed under keeper! Served over Orzo with Parsley and Lemon Zest. Heat a large, heavy skillet over medium high heat. Cut chicken into large chunks and season with salt and pepper and poultry seasoning. Add 1 tablespoon extra-virgin oil to the hot pan, 1 turn in a slow stream. Set chicken into pan and do not turn for 2 or 3 minutes or you will tear the meat. Brown chicken 3 minutes on each side and then remove all of the chicken to a warm plate. Add bell peppers, hot peppers and garlic to the pan. Saute the peppers and garlic for 5 minutes, tossing and turning them frequently. Add wine to the pan and reduce 1 minute. Scrape up the pan drippings. Add the chicken stock and bring it up to a bubble. Set the chicken back into the pan. 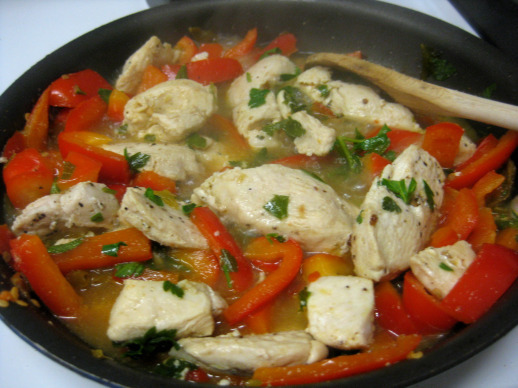 Toss the parsley with the chicken and peppers and cook the chicken through, 2 or 3 minutes. 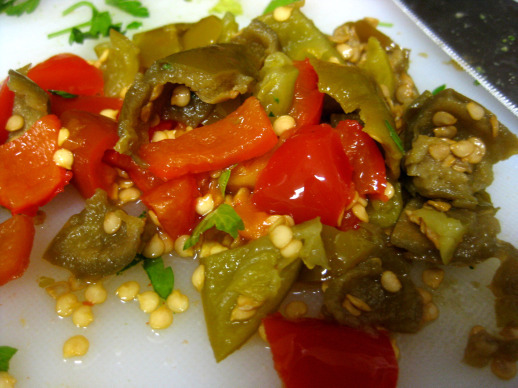 Scatter a little hot pepper juice over the pan and serve the Scarpariello over a bed of lemon orzo. WOW! Cook orzo in salted water about 12 minutes, to al dente. Drain orzo well. Do not run under cold water. You want the cooked pasta to remain hot. Transfer pasta to a serving bowl. Drizzle orzo with a tablespoon of extra virgin olive oil and season with salt and pepper. Add lemon zest and parsley and toss to combine the flavors with the pasta.